Every once in awhile, a column surfaces that starkly illustrates the Left's contempt for those who disagree with them. Last month, it was a New York Times columnist writing that he couldn't wait for his entire generation to die off so America could finally become the progressive paradise it was meant to be. This week, it was a bizarre, conspiratorial essay in the New Yorker titled "Chick-fil-A's Creepy Infiltration of New York City." New York has taken to Chick-fil-A. One of the Manhattan locations estimates that it sells a sandwich every six seconds, and the company has announced plans to open as many as a dozen more storefronts in the city. And yet the brand's arrival here feels like an infiltration, in no small part because of its pervasive Christian traditionalism. Its headquarters, in Atlanta, are adorned with Bible verses and a statue of Jesus washing a disciple's feet.
" The company has since reaffirmed its intention to "treat every person with honor, dignity and respect," but it has quietly continued to donate to anti-L.G.B.T. groups. When the first stand-alone New York location opened, in 2015, a throng of protesters appeared. When a location opened in a Queens mall, in 2016, Mayor Bill de Blasio proposed a boycott. No such controversy greeted the opening of this newest outpost. Chick-fil-A's success here is a marketing coup. Its expansion raises questions about what we expect from our fast food, and to what extent a corporation can join a community. "The restaurant's corporate purpose still begins with the words 'to glorify God,'" the writer goes on darkly, "and that proselytism thrums below the surface of the Fulton Street restaurant." 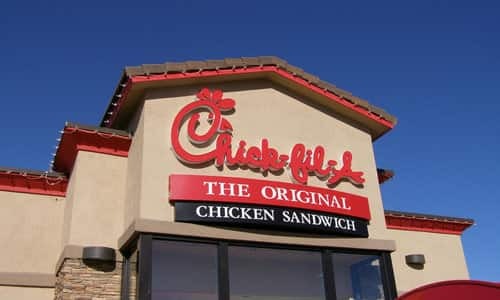 In short: If you eat homophobic chicken, you may be ingesting homophobia as well. Plus your money might end up in the coffers of a man who still believes marriage is between a man and a woman. How's that for a stomach ache? I've said it before and I'll say it again: The reason our society is being torn apart is because the Left is incessantly demonizing those who disagree with them as sinister, hateful people who deserve to be disenfranchised and ignored. They actually believe that to be true--Senator Cory Booker even grilled CIA Director Mike Pompeo on his views on gay marriage earlier this week during the confirmation hearings for secretary of state. And that is why it often seems as if there is no common ground left in the culture wars.